These days, everybody wants me to use their toolbar. Be it Google/Yahoo or any other company, all they want is to stuff their fat toolbar in my thin browser! So whats the toolbar stuff? Why is every other company trying to get a place in my browser? Well, its all about the money and getting more users use their service. Infact, its the easiest way to lock-in customers, drive traffic to their site and increase their product footprint. The basic assumption is that the end user is highly disloyal and doesn’t have any specific preference about which product to use. And to a certain extent, that is so true – Google’s search is almost as good/bad/noisy as Yahoo’s. Consumer mind is, to a certain extend impressionable and the only way to put blinds is to provide these toolbar and load them with tons of features. Google makes close to 7$ per searcher annually. Googl&Dell’s 1bn$ deal is priced at forecasted price of 10$ per searcher. Firefox’s distribution of Google search is a huge revenue driver for Mozilla. Therefore, instead of “Default Installation”, go for “Custom Installation” – The unwanted toolbar might be hiding there. Deselect the “Install Toolbar” option. In any case, if you forgot to uncheck the toolbar during installation, you can always uninstall them from your system. You can remove the toolbar from the running IE session by ‘Right Clicking’ and unchecking the toolbar. This is a temporary solution and you will see the toolbar again once you restart your browser. At times, you would like to have the toolbar in your machine but-at-your- service. i.e. you might want to disable and enable them when’er you want to. You can do this using IE’s Manage Add-ons feature. (Tools->Manage Add ons). 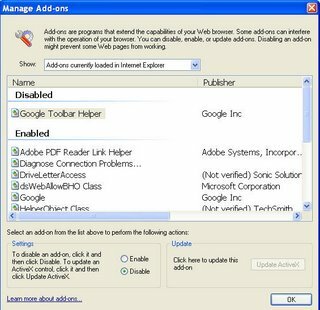 Select the toolbar you want to disable/enable and restart your browser. And you are done. If you want to enable the toolbar, go to Manage Add ons and enable the toolbar. For Mozilla users, thankfully most of these toolbar companies are targeting IE for now, so no major stuffing in the near future.